Working with Office 365 adoption we often get asked about Microsoft Teams – what are the pros and cons? Should we start using it? For many organizations that are already onboard the Office 365 journey, the question is not if, it is when and how. Microsoft has made a strategic decision on Teams as the application for intelligent communication, discontinuing their investments in Skype for Business. But people don’t like being pushed into using something unless they see the benefits of doing so. What are the advantages of moving to Microsoft Teams? In April last year, we wrote an article called, “Is your organization ready for Microsoft Teams?” In the blog post, we listed some of the benefits and some of the disadvantages with Microsoft Teams. These points are still valid, but they focus more on the pros and cons of the application itself. In this blog post, I’d like to focus on the pros and cons of Microsoft Teams from a business perspective. The breadth of collaboration tools offered in Office 365 can often leave users disoriented. Teams increases productivity by making all your collaboration– conversations, chats, online meetings, shared files, tasks, etc. available in one single app and one single interface. In addition to the widely used apps from Microsoft, you have a wide range of 3rd party apps that integrate into Teams so that your users never have to leave the Teams app to get their work done. Since Teams is a newly developed application without any legacy, it enables a more modern form of communication out of the box– with support for likes, gifs, emoticons, live link previews, etc. that enriches your communication. With Teams, you can easier focus your attention on work-related topics and prioritize your time better. Instead of spending time going through an inbox that contains messages from everyone about everything, Teams compartmentalizes information into channels. The channel only contains conversations, meetings and documents related to the topic of that specific channel. So instead of getting side-tracked with random email, or get stuck trying to clean up your inbox, you can focus your valuable attention and spend your limited time on the channels where you actually do your work. A big challenge for many organizations is keeping everyone in the loop and making everyone feel that they know what is going on. With Teams, this becomes so much easier. No longer do you have to worry about who to put on cc in an email or who to invite to a meeting. With Teams, you post your message in the relevant channel, @-mention the people you want to get notified and leave it for everyone else to read if they want, and by having meetings visible to everyone in the channel you increase transparency by enabling everyone in the channel to “pop in”. There are so many business benefits of moving to a digital workplace in the cloud. Since Teams is a fully cloud-based solution, the move to the cloud is seamless. Being able to access information from anywhere on any device is a huge business benefit. In addition, with your workplace in the cloud, you can reap the benefits of big data processing and artificial intelligence to work smarter. If you work in a multilingual organization, you can benefit from automatic translations of conversations. If you missed a meeting you can easily tune in to the part of the meeting that is of interest to you by searching for particular words that were said in the video recording of the meeting – just to name a few. In today’s agile workplace where we can easily source talent from anywhere in the world, getting people quickly up to speed is imperative. With Teams, you can quickly get new team members up to speed and engaged in the teamwork – no matter where in the world they are located. The best way to transition to Teams is for everyone who is a member of a team to fully embrace Teams and stop using Outlook all together (except for external communication). However, since there is still a deeply connected dependency on Outlook in Office 365 this becomes a challenge. 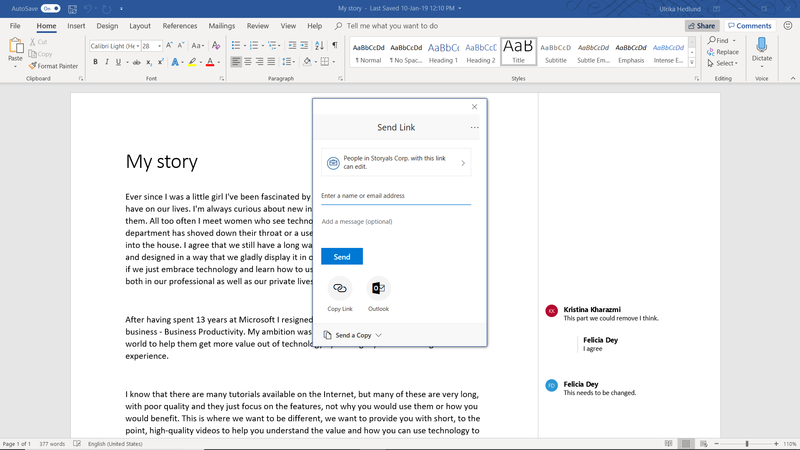 If you are editing a document in Word and send a sharing link to a team member, there is no option to send this via a Teams chat, the link is sent via email. Currently, Teams doesn’t support Group calendars, so to see your Team/Group calendar you have to switch to Outlook. Millennials and Generation Z don’t care “where” files are physically stored, they just search for what they need. Many users still like to know “where” a file is located and go through a folder structure to find it. The way files are stored in Teams can be quite confusing. Everything that is uploaded to conversations is dumped in the channel root folder. If someone tries to organize the files and move them into properly named folders, the file links in the conversations break. If you move a document to a new folder in Teams, the link to the documents with all conversations is broken. Microsoft has been working hard to include the Skype for Business meeting functionality into Teams and they have done a good job an also added new capabilities that weren’t there before. But the meeting experience still isn’t ideal, it’s not very intuitive and it doesn’t promote some of the great capabilities available in Teams for meetings (such as note-taking in OneNote). For users to embrace something as important as online meetings, they need to feel extremely comfortable with the tool. One of the key benefits with Teams is that it makes sharing so easy. Everyone who is a member of the Team automatically has access to all the channels and all the files in the Team, the same OneNote notebook, and so on. This is all great. But teamwork isn’t always that binary. Sometimes you want to differentiate and make permission settings more granular – which is not possible at the moment. When you start working in Teams you don’t have the structure ready from start. You don’t know which channels you need, you might not know exactly what Teams you need to create. This evolves over time with the work that you do. Currently, the building blocks of Teams aren’t’ very flexible (you can’t move channels or replicate Teams). This sometimes leads to time wasted doing manual replications. Say that you have a team for marketing activities. You start planning an event and create a channel for it. As the event grows, you realize that you need to create a separate Team for the event with additional team members. Currently, you would have to create a new team from scratch and manually copy or move relevant information. The cons of Teams are still related to the application itself, and many of these issues are being addressed. Still, it’s important to be aware of them and to properly guide users, if you don’t – you won’t be able to reap the benefits. Changing the way people do their work is not a question about switching from one technology to another, it’s about changing the behavior of people. For many this behavior, habits, or style of work, have been ingrained over decades. It’s naïve to think that is can be done overnight without any efforts. However, if you invest the time and you put in the efforts – the rewards are enormous! If you need help in your digital workplace transformation journey Storyals can help. Book a demo with us so that we can show you how.